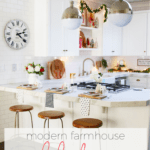 Welcome to my modern farmhouse Christmas home tour! I am so excited to be joining these lovely ladies in showcasing our holiday homes! If you are here from A Pretty Life, welcome! 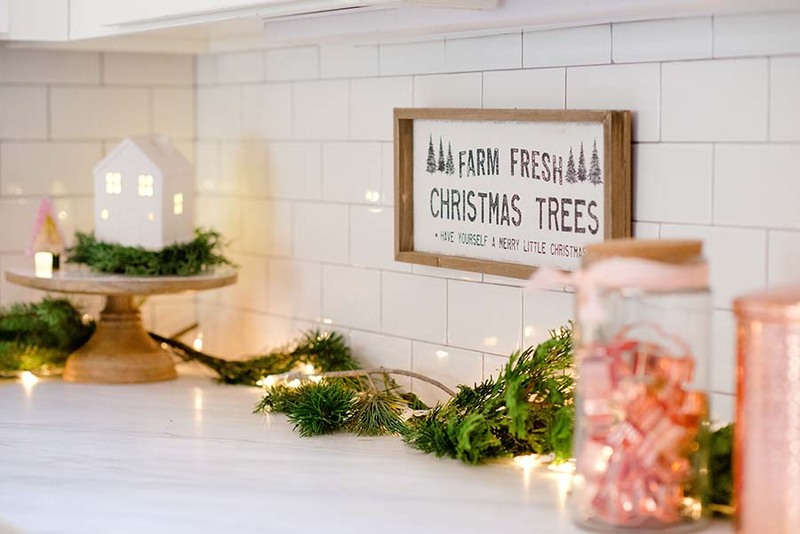 I can’t wait to show you how I decorated my modern farmhouse and filled it with holiday touches! I love seeing what others do and getting inspired by all the ideas, don’t you?! 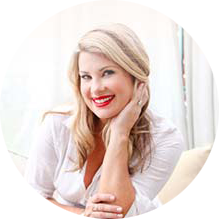 And thank you to Krista, The Happy Housie for hosting this Seasonal Simplicity Series. Make sure you pin what you love and save for later! 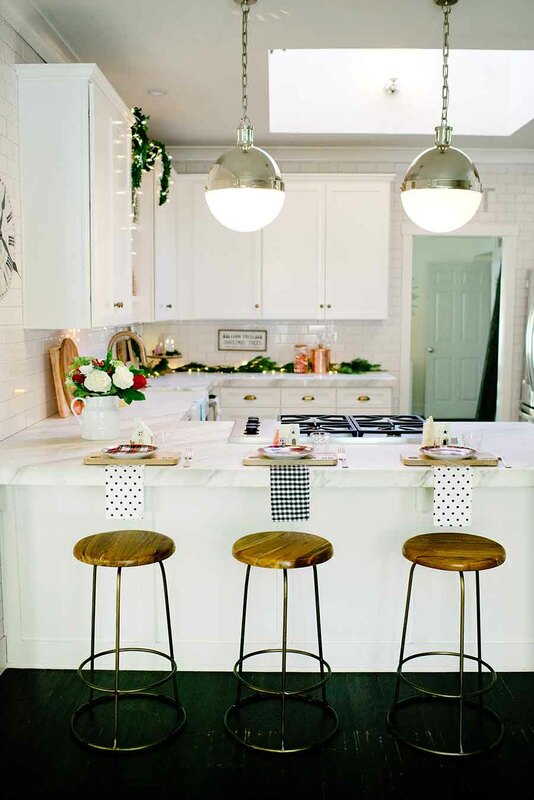 There are beautiful homes being featured each day so be sure to visit the full list at the bottom of my post. 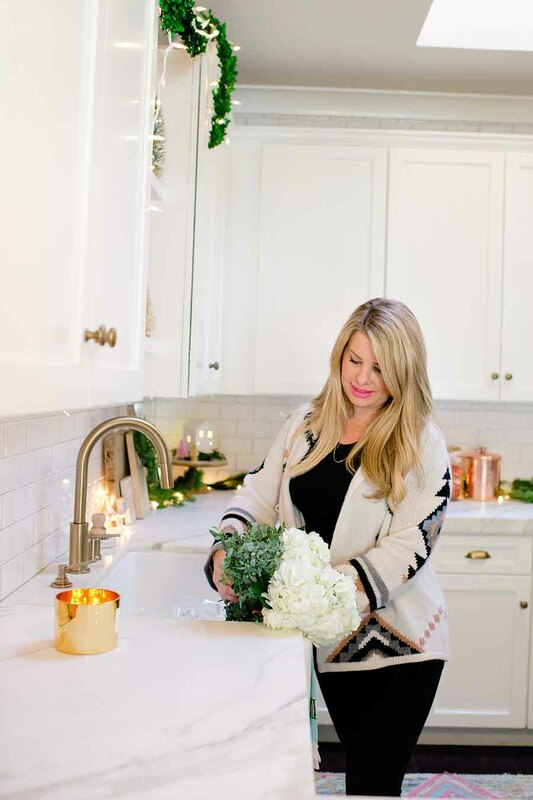 Be sure to check out the rest of my home tour, Blush and Copper Christmas! The decorations on my holiday front porch are pretty simple this year. 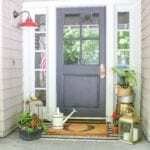 I swapped out our front door mat and added some firewood and greenery to these galvanized buckets. And I love that I can keep this up all winter too. Don’t you love the glow of twinkly lights! I added some fun frosted bulb lights to my faux pine garland and it gives it an extra festive touch that I am loving. Our favorite hanging chairs got a simple update as well. 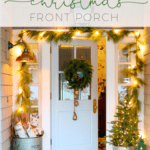 A soft sheepskin cover and black and white cushions are perfect for this modern farmhouse Christmas porch. And Romeo loves it too! 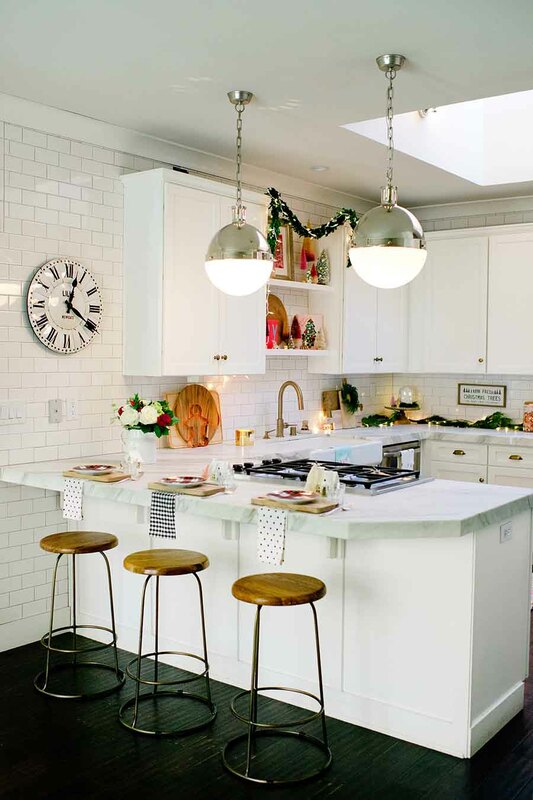 One of my favorite parts of the house to decorate for the holidays is my kitchen. Maybe it’s because I spend so much time in there, but I love adding some festive touches to this area of the home. 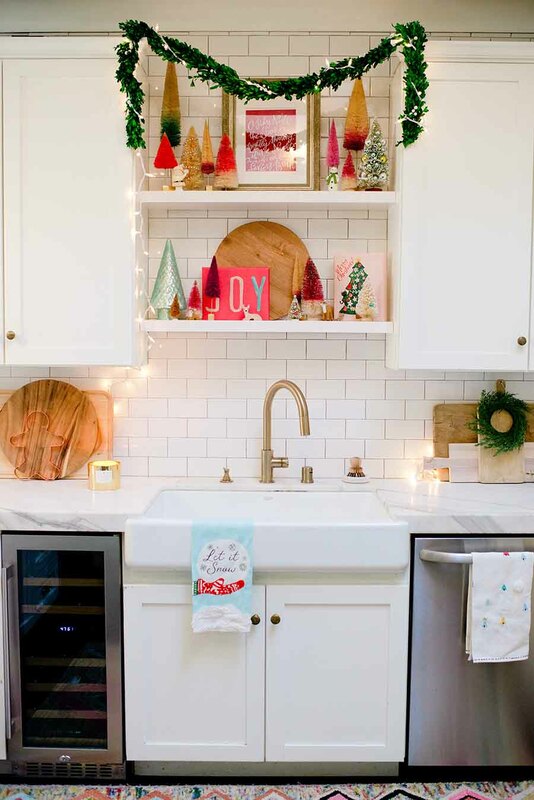 I love to add fresh garland and twinkle lights to the back of the countertops. And a few faux wreaths added to my favorite vintage breadboards are an easy update for the holidays too! 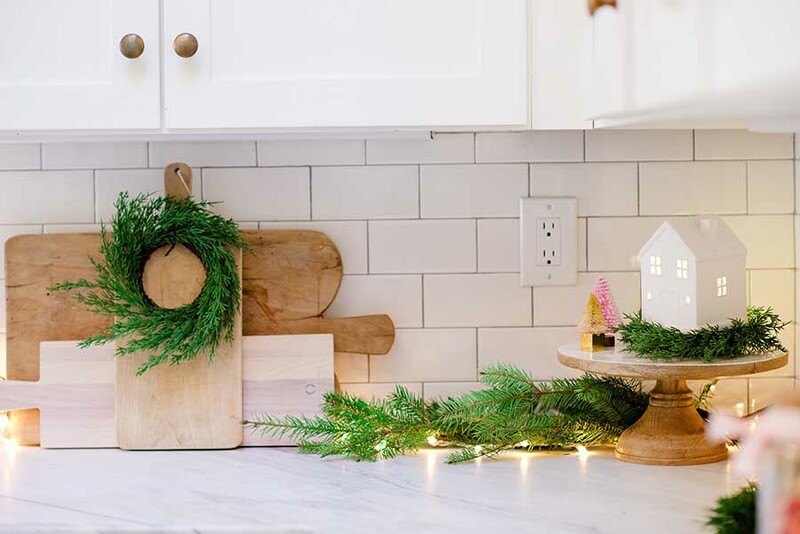 As you probably know, I love to update my kitchen shelves for the holidays. This year I used these shelves to showcase my collection of bottlebrush trees. 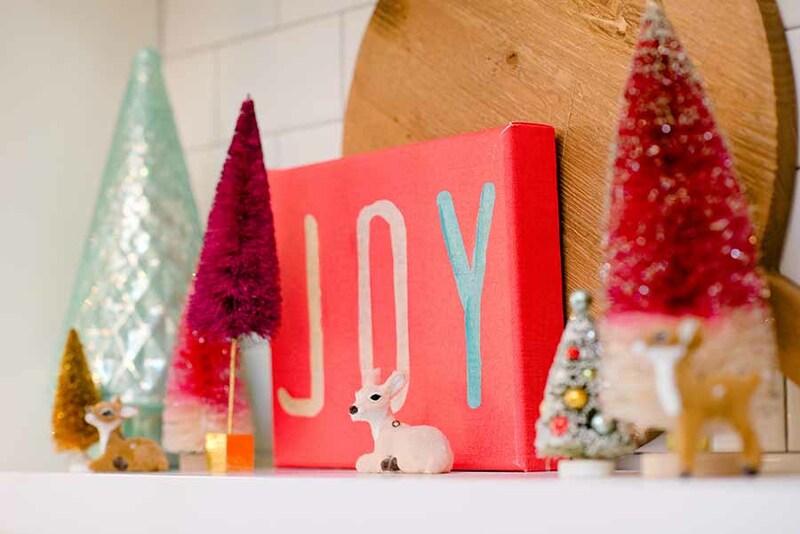 You can read all about how to make your own DIY ombré bottlebrush trees here! Ever since we got our new barstools, my kids love to eat all meals at our kitchen counter! 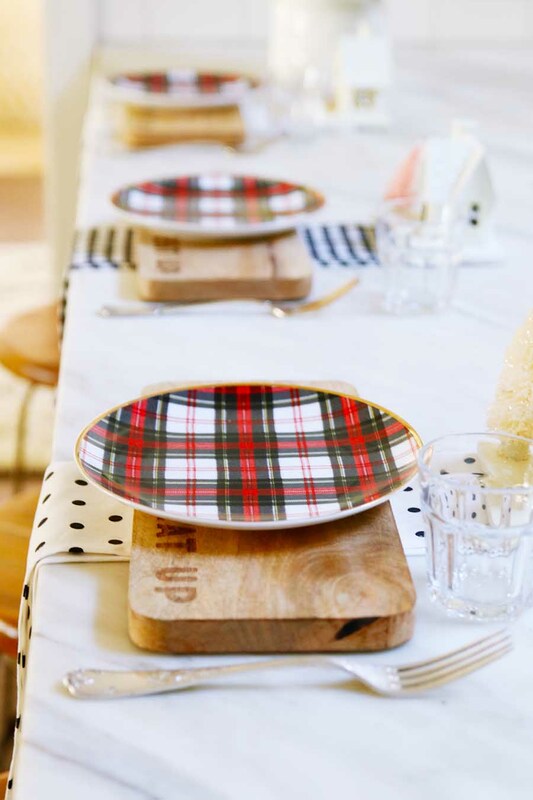 I set up this fun and happy Christmas place setting with them in mind. 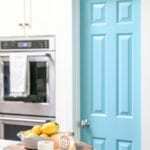 It’s perfect for weekend pancake breakfasts! Now, be sure and stop on over to Lemon Thistle to see her beautiful girly Christmas bedroom! 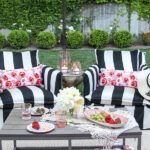 Ashley, your home is gorgeous!! 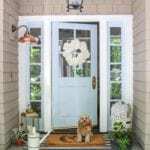 I love every detail and your front porch is amazing.